LED Street light is the future of global illumination, it is coming! Intelligent LED street light will be the smart future. 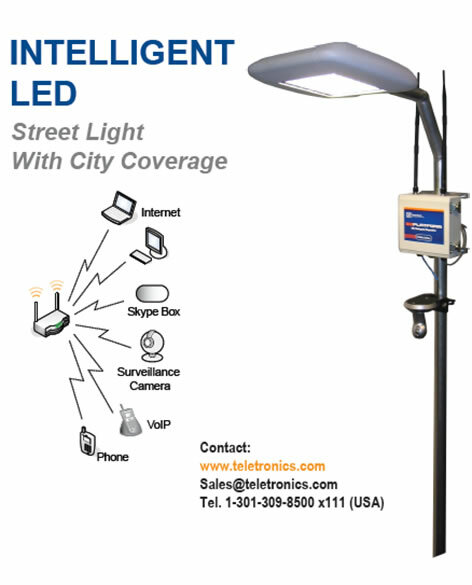 Teletronics is moving forward to the smart future by engaging in the development of Intelligent LED street lights. The intelligent street light will have automatic switch on and off, self-adjusted brightness depending on rain, shine, fog or dust, providing WiFi and internet, cameras for security, voice over IP, plugs all kinds of mobile applications. We will be at Lightfair International Trade Show in New York May 5 to 7, 2009. Coming to see us at booth No 203, private off-hour appointments are available as well. Contact sales@teletronics.com. ROCKVILLE, Md. -- (BUSINESS WIRE) -- Teletronics International, Inc. (Teletronics) announced today the release of its newest advanced wireless router packaging, the EZP-F (EZPlatform-Fiber) which uses fiber as the backbone to activate the EZPlatform® (EZP) for versatile and instant broadband wireless coverage. Similar to the concept of spreading soaking ink around each dot on a line and thus convert the original line into a multidimensional landscape, the line is an optical fiber line and the soaking ink is the ubiquitous broadband wireless last-mile coverage. The basic configuration of EZP-F is the EZPlatform® with a fiber optic head, i.e., fiber transceiver. As such, any fiber drop-off point can readily supply the bandwidth necessary to fully facilitate EZP-F’s multi-dimensional wireless AP/Router/Hotspot/Repeater for data, voice, video, and surveillance applications, all plug-and-play. “In the US, China as well as other places around the world, fiber-to-the-building and fiber-to-the-curb are already a phenomenon, but fiber-to-the-room or fiber-to-the-desk is not; this is where our new package comes in,” said Dickson Fang, the President and CEO of Teletronics, “with the EZP-F we now have an instant plug-and-play solution for last mile broadband wireless coverage in any area which has a fiber outlay.” Fang further elaborated that “the fiber owner does not need to be bogged down with wireless issues and can, with the EZP-F, confidently make a ‘broadband available’ statement.” Still, considering the simplicity of the EZPlatform® which uses single or dual high-power radio cards at 1W (2.4G) and 600mW (2.4/5.8G) for coverage, and contains two serial ports and two Ethernet ports, the EZP-F can easily incorporate GPS, GPRS, RFID, VoIP, surveillance cameras, field meters, motion sensors and data networks for multiple industrial and commercial applications. There are three versions of the EZP-F available for immediate purchase: Single mode through single fiber at either 1310/1550nm or 1330/1550nm, and single mode through dual fiber at 1310nm, both intended for long distances of 25 to 60 Km transmissions, and the third version is multi mode through dual fiber 1310nm for short distances of up to 2 Km transmissions. All are commonly used fibers. The cost of each unit is around $1,000 depending on the customer’s available fiber configuration. Each unit comes with two high-power mini PCI cards embedded in the EZP at either 2.4G or 5.8G, to allow powerful broadband coverage. Teletronics’ engineers provide free consulting services to potential customers to maximize the application. Teletronics is a boutique US based company since 1985 which specializes in outdoor last-mile broadband systems. It designs, develops and manufactures a complete line of products and solutions for high-speed wireless applications sold around the globe. Visit www.teletronics.com. Teletronics designated Wireless Data Products of UAE as its EXCLUSIVE Distributor in the region. Teletronics International, Inc. is pleased to announce that the Company has designated Wireless Data Products of UAE as its EXCLUSIVE Distributor in the region. This represents a major strategic decision by the Company to support a single qualified professional institution to distribute Teletronics' products. "While our broadband wireless products have been selling in more than 60 countries around the world through multiple channels, both exclusively and non-exclusively", noted Dr. Dickson Fang, the President of Teletronics, "we always look for dedicated and committed individual distributors to exclusively represent our products in their respective territories." And Dr. Fang added, "UAE represents a highly competitive market, where every kind of product can be found, durable or not durable; every exporting company is there, big or small: and every kind of selling and marketing tactic has been played out, fair or unfair; we grant Wireless Data Products the Exclusivity with honesty, trust and respect. As a well-established 20+ years company, longer than nearly all of our competitors, Teletronics goal is always a better professional focus, better support, better price and ultimately better customer satisfaction." Mr. Henrik Arshavir Zeinalian, the President of Wireless Data Products, was equally excited about the Exclusive Distributorship. He said, "Teletronics has good products and we have good customers. We have promoted Teletronics' products for years, now we are the Exclusive Distributor, customers should have a peace of mind about support and future upgrades."